And, of course, be in your price range! With an impressive array of features and consistent, reliable grinding performance, there’s a good chance this grinder is for you. Keep reading The Coffee Maven’s Breville Smart Grinder Pro Review. The Breville Smart Grinder Pro might be the most versatile grinder in its price range. With 600 different grind sizes (not a typo), grind time increments down to 0.2 second, an LCD digital display, and the ability to grind for both single shots and full pots, there isn’t a better do-it-all grinder on the market with this price tag. Performance: 91 // Get reliable, consistent grinding with the included conical stainless steel burrs. Compatible with almost all portafilters and has enough clearance to fit a whole filter basket. Truly gives you flexibility across the grinding spectrum, but has issues with coarse grinding for French Press. Features & Design: 91 // 600 different grind sizes is pretty remarkable. LCD display makes changing grind size and time settings extremely easy. It’s nice being able to see numeric values for each as opposed to just “this notch is coarser.” Magnetized attachments are a nice feature. Materials: 92 // Stainless steel burrs aren’t as good as ceramic burrs, but in this price range you’ll never find ceramic burrs. Brushed metal exterior has good heft, look, and more durability than similar all-plastic grinders. Durability: 90 // Stainless steel burrs won’t break and the brushed metal exterior adds to appeal. Users have not reported many motor failures. Needs to be cleaned regularly in order to avoid clogs. Comes with a 1 year limited warranty. Value: 97 // Top marks in this category as this Breville Smart Grinder Pro review will clearly show the range of performance for this model in a relatively low price range. Brand: 90 // While not as notable as brands like Baratza, Breville is a leader in kitchen appliances and has been a big name in coffee for a long time. The Breville Smart Grinder Pro comes fully loaded with a robust set of conical stainless steel burrs. These burrs work well with beans of all types, but beware frequent usage of super oily espresso beans. If you make one or two espressos per day, you shouldn’t have much of a problem with regular cleaning. If you want to make more than that, you might want a dedicated espresso grinder. 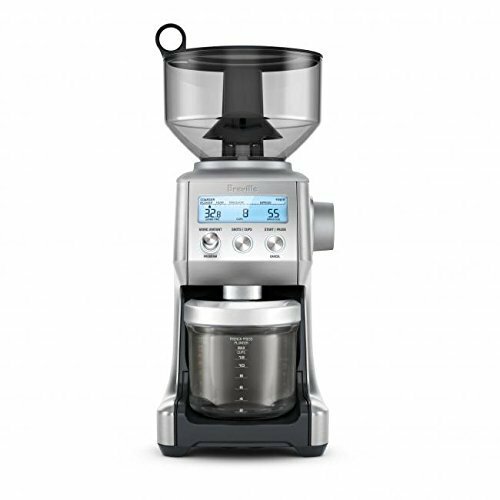 Check out the Baratza Sette 30 for an entry-level espresso grinder in the same price range as the Breville Smart Grinder Pro. I’d recommend the Baratza Sette 270 if you want something more robust. Six hundred grind sizes — that has to be a typo, right? That’s 600 different grind sizes, giving you unprecedented fineness control in this price range. …and 10 micro-level adjustments help you dial it in. This is a major improvement on the previous model from Breville, the older Smart Grind (not Pro), which only offered 25 different grind settings with no micro-level adjustments. The table below (from the Breville Smart Grinder Pro user manual) shows which settings you should use for each type of brew. Which style of coffee do you prefer? A simple, easy-to-read LCD display tells you exactly what you’re doing. In the image above, you can clearly tell you’re on grind size #36, right in the drip coffee range according to the bar indicator on the top. You’re also grinding for 3.8 seconds. Note: This grinder allows you to control grind time in 0.2 second increments. Bonus Feature! The Grind Amount knob on the left side of the interface doubles as a Program button, which can save the Grind Time and Grind Size settings you love. Simply press and hold until the grinder beeps, and — BOOM! — settings saved. Best of all, if you want to scale up for multiple shots or cups, just press the middle Shots/Cups button and the Breville Smart Grinder Pro will recalculate the Grind Time for your new volume. Both attach magnetically to make sure your grounds are deposited directly into your portafilter. Not an espresso drinker? No problem. The Smart Grinder Pro also has enough clearance to fit a full-sized coffee filter basket under the spout. The grinder also comes with a plastic ground coffee canister made from the same UV-resistant plastic as the bean hopper, helping prolong your coffee’s freshness. Pro Tip: Always grind your coffee right before brewing. Grounds can begin to lose their flavor, aroma, and all around freshness in as little as 15 minutes! But if you’re an early riser and don’t want to wake the family every morning, well, go ahead and pre-grind. The Breville Smart Grinder Pro’s bean hopper has a 1 lb capacity and is made from UV-resistant plastic. This prevents the early degradation of your coffee beans, meaning you can feel OK about pouring in the whole bag. The bean hopper also features a lock/unlock switch, shown above. Need to access the burrs or want to pour out the beans in the hopper? Move the switch to Lock and the flow of beans is turned off for easy, mess-free removal. A good grinder is the key to great coffee, and the Breville Smart Grinder Pro is indeed a good grinder. It has its limitations — notably at the coarser end of the grind size spectrum — but it delivers consistent, precise grinding without breaking the bank. Whether you’re a newcomer to delicious coffee or you’ve been drinking black since you were in preschool, the truth is the same: a strong coffee grinder is the equipment key to coffee success. If you’re looking for a dedicated espresso grinder, I really would recommend the Baratza Sette series. But if you want a versatile, easy-to-use grinder for all kinds of coffee, give the Smart Grinder Pro a long look. We want to hear your Breville Smart Grinder Pro review! Have you ever used this grinder? Do you recommend something else in this price range?